I have loved making things since I was a little girl. I was just as happing building a tree house with my brother as sewing. It didn’t matter what: craft kits, art projects, tree house, electronic wiring projects, model rockets, even a transparent plastic car with working gears, differential and steering (which I still have). 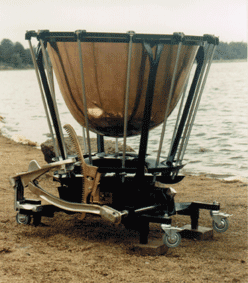 When I started working on analyzing and re-designing Dresden style timpani, all these experiences, along with my science and math classes from high school, helped me, along with a class in musical acoustics in college. The first step was finding a source of timpani bowls. 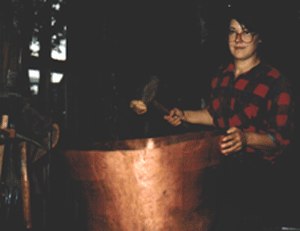 We went to the best, D. Picking and Company where Robert Picking refused to sell us bowls, but decided to have his artisan coppersmiths teach us how to make them! 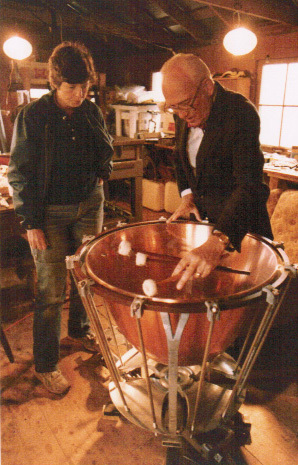 Cloyd Duff, who I had been studying with gave me many insights into bowl shape, and visited our shop to give me feedback and recommendations about the new timpani. Learning in Picking’s shop was interesting and exciting. However it took almost two years to master the copper work in our own shop with our tools. During that time I was also working on the mechanical design, consulting with with machinists to implement my ideas. We also worked with a artist/sculptor who made the wooden patterns for the aluminum sand castings that make up the drum frame. 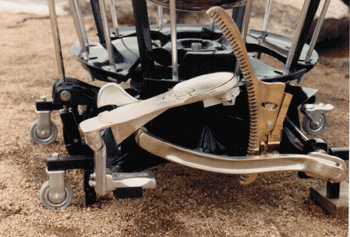 Upper drawings show uneven tensioning caused by arcing motion of the spider as the pedal moves the spider up and down. 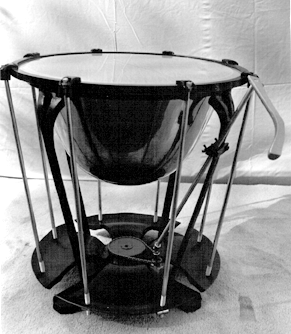 This design is used in Ringer, Hinger and Light timpani, even today. Lower drawing shows my rack gear design that pulls the spider down perpendicular to the head throughout entire pitch range of head for more focused, more clear pitch at all pedal settings. You can read through each of my four patents by clicking dates below. They are organized by the date the patent was granted. Each patent was pending for about three years from filing date to granting date. When you file, you have to research all the other patents that are similar. 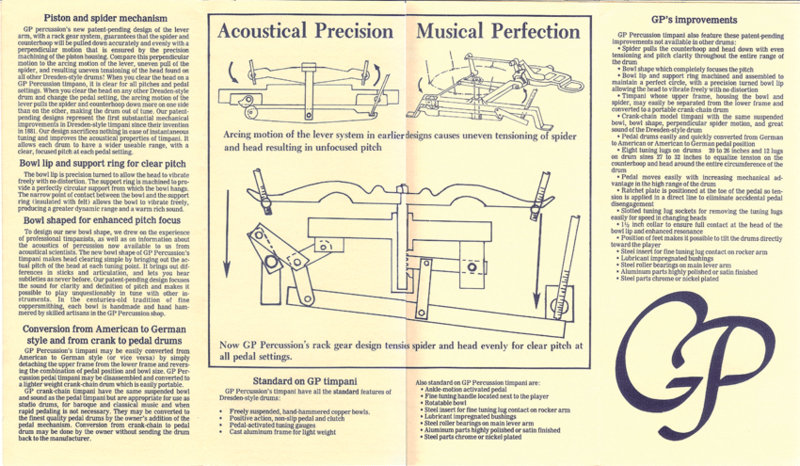 The main patent, the first one, has a list of all previous pedal drum timpani patents going back to the 1880’s. 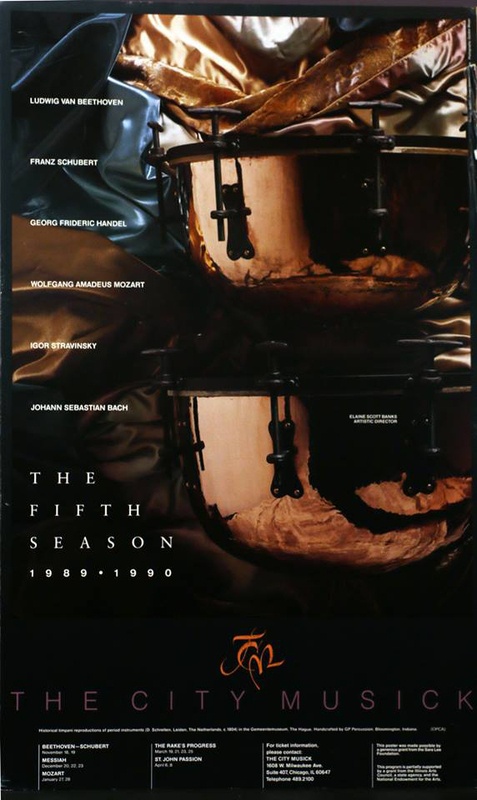 Great stuff for timpani history enthusiasts! *All patents have the same cover artwork. The ID number and dates are on the second page of these pdfs. 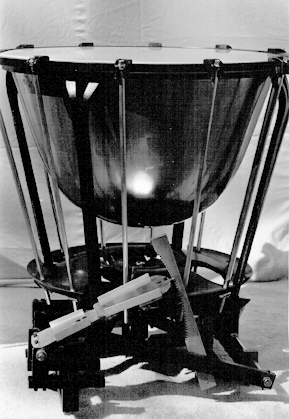 In 1989, I started building reproductions of historical timpani – exact copies of a pair of timpani made in 1815 in The Netherlands that are in the Gemeentemuseum in The Hague. The set in this beautiful poster on the right feature complete authenticity with T-handles and fittings made by hand by a blacksmith.